When I’m working on big projects, I will either obsess and work on it until it’s done – ignoring everything… or I’ll lose interest in the project and not finish at all. Something I’ve been working on is starting projects and following through while keeping life on a normal schedule. The squid quilt is going to be one of those projects. Luckily I can make the little hexagons anywhere, and they are starting to add up! Even with a busy summer work-wise, I think I’m close to having half of all the blues made, and I have a good chunk of peachy colors done for the squid itself. I’m looking forward to having them all made so I can lay them out and start playing with color and placement. They are like fun game pieces or something… for now, I just need to keep making these little guys. I had a great doctors visit this week too ~ seems my triglycerides went WAY down, fasting blood sugar when down, vitamin B levels are back to normal, iron levels went up, and my candida count went from 4+ to 2! So my diet is definitely making a difference, at least in some aspects, and that makes me feel really good!! There are a few other issues we’ll be working on and testing… but for now, what I am doing is making things better instead of worse ~ and that’s enough to make me feel good. Hi, you're doing great!! Keep up the good work and keep eating well too. I think your squid quilt is going to be fab!! 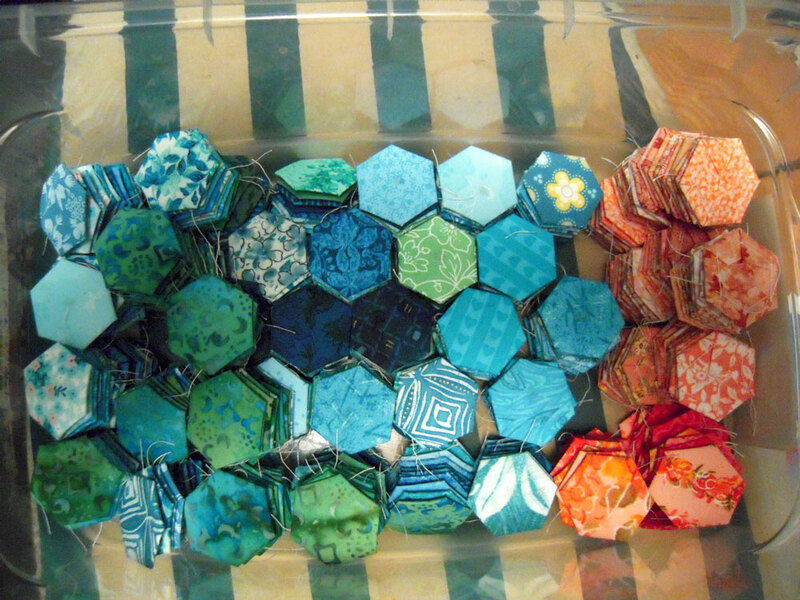 I would never have thought of doing that with hexagons!